Sellers stand to earn much from fast shipping tags on their Walmart listings. 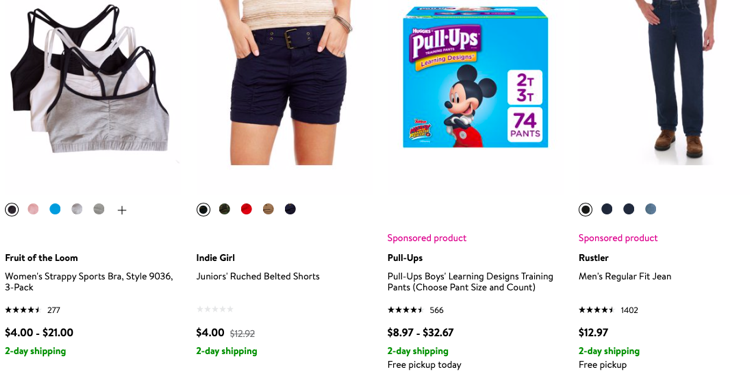 For starters, they work to decrease competition in filtered searches, as Walmart highlights fast shipping tags across the website. They’re also excellent for conversions, capturing last minute shoppers, and more. Beyond the seller benefits, fast shipping is becoming a standard requirement for buyers. It’s no longer just something that’s nice-to-have, but shoppers have come to expect it, and sellers need to provide it to stay competitive across marketplaces. Many smaller marketplace sellers are falling behind, largely because of increases in costs associated with processing and fulfilling orders more quickly. However, utilizing programs like Walmart’s Free 2-Day shipping and its counterparts across channels gives you the opportunity to utilize resources from a larger retailer, so that you can compete. Walmart Free 2-Day Shipping leverages the idea that customers who checkout with more items in one transaction can offset higher shipping costs, allowing sellers (including Walmart itself) to save money on shipping individual products. eCommerce marketplaces are often flooded with the same products, which can result in massive competition. Opting into a program like 2-day free shipping helps merchants rise above the competition, because fewer sellers will offer it. Not only will fast shipping tags appear on your listings, increasing customer trust, but we’ve found that the Walmart website gives preference to items with fast shipping tags (even if shoppers don’t filter for it). So for merchants offering this free 2-day shipping, especially early on, they will gain an early mover advantage over those who haven’t yet offered faster shipping. While critical in Q4, this applies year-round, because customers are greatly concerned about shipping costs and speed to the point where they expect fast shipping as a standard rather than a luxury. Getting on Walmart Free 2-Day Shipping is crucial for winning Walmart’s Buy Box. One Deliverr seller started winning the Buy Box within a few days of implementing Free 2-Day Shipping tags. There are multiple factors that the algorithm takes into consideration, but the majority of your chances will come from total cost of the product (including shipping), seller reviews, and account health. The service level agreements needed to stay on Walmart’s fast shipping program mean that your merchant account will stay healthy and you’ll continue to delight customers with quick and convenient delivery. A large percentage of shopping cart abandonment† relates to shipping cost and speed, although different research sources have slightly different numbers (typically between 60 and 84%). Consumers increasingly want products quickly and cheaply, and they want these services year-round. Consumers increasingly demand faster and cheaper shipping, with a strong preference for fast (1-4 days) and free options. Customers are more likely to make a purchase if they are certain of their product arriving quickly, which works to increase trust. Walmart’s 2-Day Free Shipping badge on seller marketplace profiles may boost consumer trust since Walmart doesn’t make it immediately obvious that the product isn’t directly shipped by them. Walmart also helps to tackle trust issues in other ways. For example, Walmart customers can return 2-Day Free Shipping products directly to a Walmart store, even if they’ve been purchased from a third-party seller. Walmart then handles the process of transporting goods back to you. This will work to increase conversions, as customers can rely on fast delivery and hassle-free returns. Opting into Walmart’s fast shipping program will help you stay competitive, reduce cart abandonment, get higher placements in search, and win the buy box. Now that we’ve gone over the benefits of this program, we’ll go over two ways that marketplace sellers can enroll. Walmart lists 2 ways to get onto their fast shipping program; Seller Fulfilled and Third-Party Fulfilled. Through the seller fulfilled route, you must have been a marketplace seller for at least 90 days and must meet Walmart’s service level agreements to get and stay on the program. Sellers can request access through Seller Central and will find out if they’ve been approved or rejected within 48 hours. Once approved, you can select which states and regions you can support for 2-day shipping. It can be challenging for some sellers to set up a fulfillment process that can assure 2-day delivery, so the logistics here tend to be more complicated than the second option. With the third-party fulfilled route, sellers must go through Walmart’s fulfillment partner, Deliverr. In this option, as long as you’re signed up and fulfilling with Deliverr, you can contact your Deliverr account manager and they will take care of enabling fast shipping tags on your listings. For new sellers, it takes approximately 2 minutes to create a free account on Deliverr and connect your Zentail account. Zentail and Deliverr integrate seamlessly to keep your inventory organized. All Deliverr sellers are pre-approved for Walmart’s fast shipping tags, and it’ll take approximately 24 hours for Deliverr to whitelist your listings. Deliverr handles the entire fulfillment process from order to delivery, so you don’t have to take care of meeting SLAs. Deliverr also promises transparent, hassle-free pricing and provides a cost calculator to show your all-inclusive fulfillment price. Walmart’s Free 2-Day Shipping program is just one of several alternatives spread across marketplaces. Participating will keep you competitive as the eCommerce industry grows, and help you capture loyal customers. Sellers who provide fast shipping tend to see as much as 500% increases in sales, fewer competitors, higher conversions, and improved visibility across search and in categories. Michael Krakaris is Co-Founder at Deliverr. Deliverr provides fast and affordable fulfillment for your eBay, Walmart and Shopify stores, helping to boost sales through programs like Walmart Free 2-Day Shippingand eBay Guaranteed Delivery.